I appreciate being on the list for Best Teacher Blog, but I am even more pleased to have 4 students on the Best Student Blog list. I think this sums up very nicely what goes on in my classroom. We work together. The students blog and I blog, and when 4 of us make the list we can see that we are making a difference. People read what we write. And even if it is not thousands of readers, every reader counts. In our class we know this is the right thing to do. We know that changing our classroom into a global classroom is easy, fun, rewarding and at the same time a great learning experience! For every Skype talk we have with students in different parts of the world, we gain experience. And every time we write a blog post, we know some might read it and therefor we put both a lot of work and effort into it. We are preparing our students for future employments where collaboration and team effort is valued. Let the voting continue and with so many great bloggers on the list I’m happy just to participate! 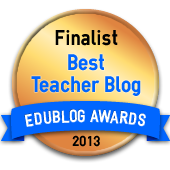 Thanks for the Edublogs Awards Nominations!